Great things coming: Bike Adventure twice as big! The Fuller Center for Housing is one of the fastest growing non-profits in the United States, and its annual bicycle adventure is on par to become one of the fastest growing charity rides. This year’s trip is half the distance, but is on track to double its success. In 2008, the inaugural Fuller Center Bike Adventure blew past its $100 thousand fundraising goal by bringing in over $134 thousand for FCH covenant partners. Trip leaders felt they could double the goal, and challenged this year’s riders to not only pedal 1,300 miles from Michigan to Florida, but to help raise $200 thousand and put their faith and love into action for five weeks. The second bicycle adventure has twice as many riders and will participate in twice as many construction projects. Sixteen cyclists will head out on July 10 to spread the word across seven states and spend eight days helping eight different covenant partners build and repair homes for families in need. This summer’s ride is special in its dedication to the late founder of The Fuller Center, Millard Fuller, who passed away in February 2009. Millard and his wife Linda led fundraising walks of 700, 1000 and 1200 miles during the years they grew Habitat for Humanity. 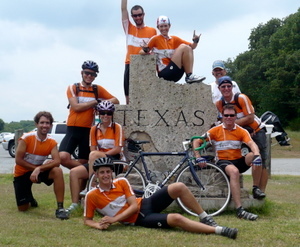 Those long-distance events inspired the first Fuller Center Bicycle Adventure in 2008. Following the precedent set by the 2008 ride, in which an 18-year-old rode alongside a 62-year-old, the cyclists come from a wide variety of backgrounds. A teacher in her late forties and a naval officer in her late twenties will ride and build with college students, Fuller Center El Salvador veterans and a young man riding in honor of his father, who passed away suddenly in April. Even Fuller Center President David Snell signed up for a one-day ride. The cyclists will also be the lead riders for six local rides being sponsored by FCH covenant partners. The local, organized events are a new addition to the cross-country ride, designed to create even greater participation and fundraising opportunities for the covenant partners that the cyclists will be passing through. For information on the route, riders and how you can donate or participate, please visit the Fuller Center Bicycle Adventure’s official Web site: FullerCenterBikeTrip.com. The team is still in need of both cash rider sponsorships and in-kind donations, which will allow every penny of the $200 thousand raised to go toward simple, decent housing. The team is also interested in speaking to anyone who might like to come along as a volunteer support person and full-time SAG wagon driver. Those interested can e-mail: bike@fullercenter.org.